In The Midas Touch, PNGi documented in detail how, in tandem with his political career, Peter O’Neill has built an extensive business empire with assets worth hundreds of millions of kina. O’Neill’s good fortune has been contagious for a select group of business partners and associates; prime among them are the Cragnolinis, Sir Luciano and his wife Lady Ni Yumei, and their L&A group of companies. O’Neill’s close relationship with the Cragnolinis can be formally traced back at least as far as 2008, when O’Neill was Public Service Minister. 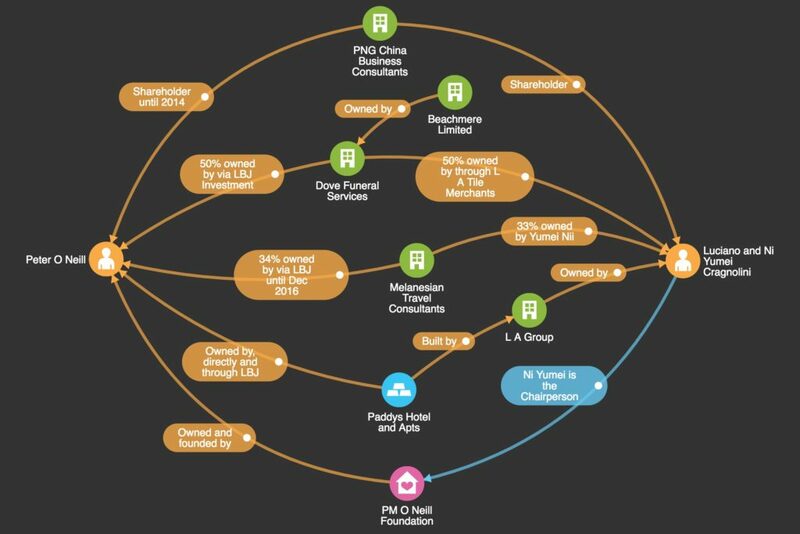 In that year, Peter O’Neill became a minority shareholder and director in the company PNG China Business Consultants Limited, alongside Sing Yun Ling from Hong Kong and Ni Yumei Cragnolini. The company specializes in wholesale trade and consulting. During May 2009, Peter O’Neill strengthened his relationship with the Cragnolinis through their joint acquisition of Dove Funeral Services, which O’Neill, Lady Ni Yumei and Sir Luciano still share ownership of. The following year, in 2010, Peter O’Neill (through his company Remington Technology) bought a 34% stake in the Cragnolinis company, Melanesian Travel Consultants Limited. O’Neill’s shares were purchased from Ni Yumei Cragnolini who retained a 33% interest. A Chinese national, Yuewei Ni held the the other 33%. O’Neill later transferred his shares from Remington Technology to another of his companies, LBJ Investments Limited. In 2011, O’Neill and the Cragnolinis’ mortician business, Dove Funeral Services, struck trouble. As a new funeral home was about to be constructed in Taurama, landowner groups claimed the land was acquired through fraudulent means. They said the land was sold illegally to “two prominent Port Moresby businessmen” without their knowledge or consent. The issue seems to have been ironed out though, as the following year, local media are rallied to the launch of the new business premises. Peter O’Neill, who was by now Prime Minister, was not shy about using his new position in order to promote the business. The National newspaper reports ‘O’Neill had congratulated the management and staff of L&A Group of companies for the launch of their new business.’  Although nowhere was there any mention of Peter O’Neill’s own interest in the venture. The following year, 2013, the company hit some more gruesome controversy. The media reported up to 100 unclaimed bodies, ‘including dead babies, from Port Moresby General hospital’s morgue’ had been burnt in an open pit by Dove Funeral Services, leaving unbearable smell and fumes in the neighbourhood. The police reportedly contemplated legal action. In 2012, Dove Funeral Services registered a subsidiary, Beachmere Limited. Very few details about this new company owned by O’Neill and the Cragnolinis is available from the Investment Promotion Authority. Wrakuale, A. (2012), ‘Modern funeral service opens in city’ The National, 30 March 2012, accessed on 15/04/2017. Blackwell, E (2013), ‘PNG funeral home ‘burns bodies in pit’ accessed on 19 April 2017. 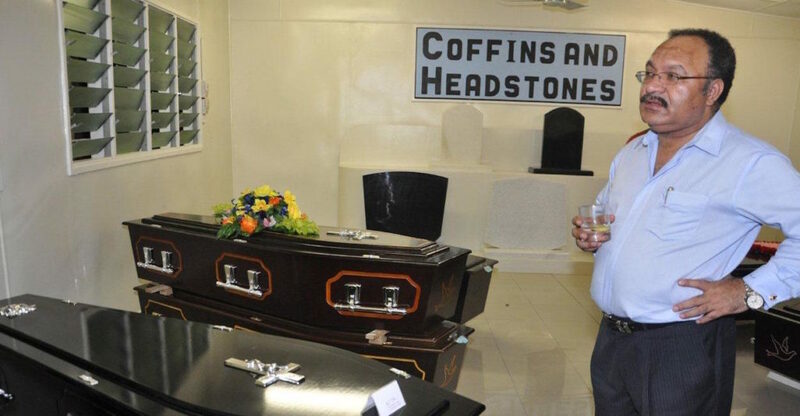 ‘PNG Police ponder charges against funeral home’ Radio New Zealand, accessed on 19 April 2017. At the same time as O’Neill and the Cragnolinis were developing Dove Funerals, their relationship was further bolstered after O’Neill engaged L&A Construction to build his new hotel and entertainment complex, known as Paddy’s Hotel. Paddy’s Hotels & Apartments Limited is the product of the 2009 merger of three of O’Neill’s companies: Omerta Limited, Bluehaven No. 42 Ltd and Pangia Enterprises Ltd (three companies that featured a decade earlier in the NPF Commission of Inquiry and, in the case of Bluehaven, the more recent Investment Corporation Commission of Inquiry – see The Midas Touch Part II). The Paddy’s complex, in the Port Moresby suburb of Boroko, comprises a hotel and apartments, conference facilities, Irish pub and a restaurant. How O’Neill financed the building work by L&A Construction is unclear from public records – as we will explore more fully in a future article. Further evidence of O’Neill’s close relationship with the Cragnolinis emerges in 2013, when Ni Yumei is given the Chairmanship of O’Neill’s ‘PM O’Neill Foundation’. Paddy’s Hotel & Apartments Limited, Application for registration of amalgamation proposal lodged with IPA on 05/11/2009, Investment Promotion Authority. The business alliance between O’Neill and the Cragnolinis, which we have seen dates back to at least 2008, in 2010 moved close to the State’s coffers. In May, both the Cragnolini’s L&A Construction and O’Neill’s Remington Technology were contracted to renovate the PNG Parliament building. L&A Construction was hired to lay new marble and granite tiles, while Remington Technology supplied and installed new scanners. At that time, the Speaker of Parliament, Jeffery Nape, explained that he would be ‘seeking funds from the Department of Finance for this much-needed work.’ This was immediately before O’Neill became the Finance Minister. The Oxford Business Group estimates the contract value for L&A’s parliament renovations, which were carried out over a long period, was worth K23 million ($9.3m). The value of the Remington contract is not known. The Parliament work attracted some very public controversy, as the L&A renovations included the removal and destruction of 19 traditional masks and a totem pole from the parliament building, which led to successive court cases that found the actions both unlawful and unconstitutional. The work at Parliament house was the precursor to an impressive list of government contracts awarded to L&A Construction under the Prime Ministership of the Cragnolinis business partner, Peter O’Neill. This list of contracts includes the complete renovation of Mirigini House in Waigani, the Prime Minister’s official residence. This contract was apparently awarded to L&A directly by the Department of the Prime Minister (for an undisclosed amount). I want to assure the people that the procurement requirements were all complied with and I know that we will get a very good value for K70 million for Mari [sic] Haus,” he added. The Post Courier has valued the Marea Haus contract at about K80 million, while the Pacific Islands Report has said K90 million. These are far from being the only sizeable State contracts given to the L&A group of companies. In 2015, the Central Bank of Papua New Guinea, awarded a contract to Beacon Consulting to manage the construction of a new K90 million currency distribution facility in Lae. The sub-contract for the first part of the project was given to L&A Construction, and in late 2016, L&A was confirmed as the selected builder for the whole project. L&A was also granted the contract to refurbish the government’s Morauta Haus in Waigani. The contract value is unknown and very scant details are publicly available. L&A Construction was also hired to build the new headquarters for the National Identity Centre in Waigani (a contract granted through Huawei and financed through a Chinese Exim bank Loan), at an unknown cost. As well as all this work, much of it literally at the heart of government, L&A construction also benefitted from construction contracts for the 2015 Pacific Games. L&A was granted government contracts to renovate the Taurama pool (K3.8 million) and the Murray Barracks gymnasium (K1.8 million) and the Murray theatre (K1.7 million). None of these projects are featured on the L&A website. Lady Ni Yumei Cragnolini has served as a PNG Sports Foundation Commissioner and sat on the board of the Foundation, which was involved in the funding process for the renovation works. In July 2014, Peter O’Neill, accompanied by his minister for Sports and Pacific Games, Justin Tkatchenko, officially opened the renovated pool. According to its own advertising materials, L&A has also done renovations work for the state airline, Air Niugini and the state owned National Airports Corporation. It appears, the Government of Papua New Guinea is not the only state to be funding L&A work. The L&A group of companies has also completed significant work for the Australian government. In August 2015, L&A Construction was awarded three different contracts from the Australian Department of Defence totalling over A$80,000. In November 2016, L&A Construction bagged a contract worth over A$33 million dollars from the Department of Foreign Affairs and Trade, as part of the Australian Aid program for the construction of the School of Business and Public Policy at the University of Papua New Guinea. Since 2011, L&A Construction has also refurbished the residences of the Australian High Commission and built a safe room and refurbished a bathroom for the British High Commissioner. ‘Increased public spending aims to keep sector on an even keel,’ Oxford Business Group, accessed on 16 April 2017. Moi, C. (2016), ‘Court’s decision disputed’ The National, 12 July 2016, accessed on 16 April 2017. L&A Construction company website, accessed on 16 April 2017. Kolma, F (2013), ‘PM: Oil search to fix Pineapple building at K51m,’ PNG Post Courier, 15 November 2013. Hansard, 7 February 2013, pp16-17. ‘Renovated PNG Government Office Building Reopened’ Pacific Islands reports, 21 March 2016, accessed on 16 April 2017. ‘Tender out for BPNG project,’ PNG Post Courier, 11 November 2015. ‘Bank of Papua New Guinea: Local contractor contracted to build new Central Bank Facility in Lae’ Plus Company Updates, 8 October 2016, accessed on 28 April 2017. Tarawa, H. (2016), ‘NID part of system, Abel says’ The National, June 20 2016, accessed on 16 April 2017. L&A company website, accessed on 16 April 2017 at , and ‘Pineapple building or the Marea Haus nears completion,’ PNG Post Courier, 30 November 2015. Nao, K. (2013), ‘L&A signs contract,’ PNG Post Courier, 28 November 2013. Papua New Guinea Sports Foundation website, accessed on 16 April 2017. ‘PM opens new Taurama Swimming pool,’ PNG Post Courier, 15 July 2014. ‘Australia: L&A Construction LTD wins contract worth $31,424.12 for D Coy and store room,” and ‘Australia: L&A Construction LTD wins contract worth $10,117.11 for Civil works for transport yard,’ and ‘Australia: L&A Construction LTD wins contract worth $39,201.83 for D Coy accommodation at taurama barracks PNG,’ Contract Awards-Companies Alert (CACA), 25 August 2015. ‘Australia: L&A Construction wins contract worth $33,679,526.39,’ Contract Awards-Companies Alert (CACA), 29 November 2016. Public LinkedIn profile of Ryan de Ocampo, accessed on 19 April 2017. The number and size of the contracts L&A has been awarded by the PNG government is reflected in it financial performance. The company’s declared assets more than quadrupled from K20 million in 2011 to almost K90 million in 2015. For any fair-minded observer, this contagious good fortune raises a range of governance concerns. In short, a corporate group whose owners enjoy intimate business ties with Prime Minister, Peter O’Neill, has received a large range of construction contracts from the O’Neill government, including for work associated with the Prime Minister’s official residence and the office block housing his department. 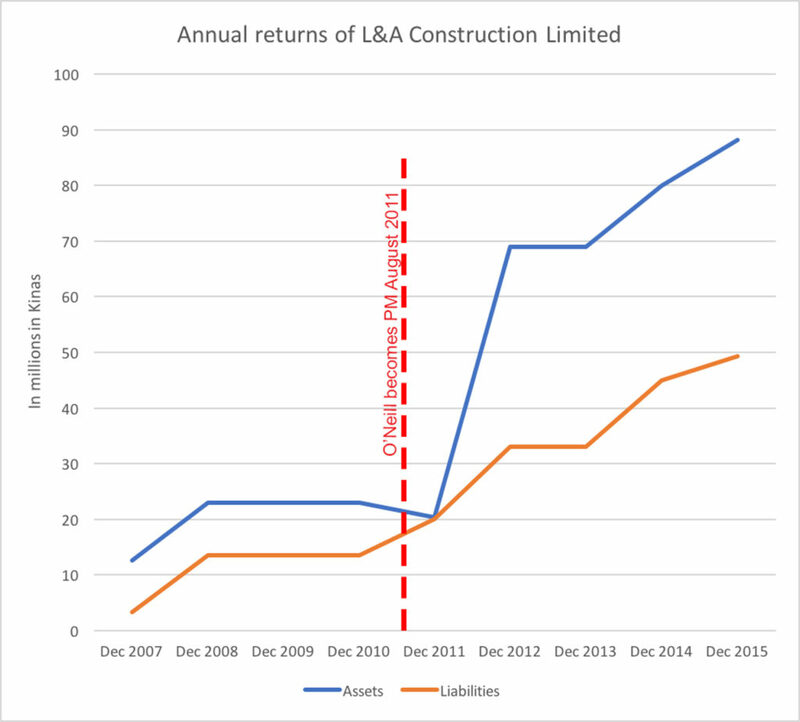 These sizable contracts have coincided with a quadrupling of the L&A Construction’s asset value, in the space of a few years. It is not being suggested that the Prime Minister necessarily unduly influenced the award of these contracts, or is receiving kick-backs from the consortium – just having a Prime Minister so closely linked to one specific firm, has the capacity to skew the award process, without any explicit influence being applied. It therefore raises questions, again, over how the Prime Minister is managing these potential conflicts of interest. Under the Constitution O’Neill has a responsibility to avoid conflicts of interest, and maintain public confidence in his office. This is a proactive duty – so it must be asked, what has the Prime Minister done to ensure these close commercial affiliations with L & A and government contracts, do not bring his office into disrepute?